Eugene E. “Gene” McNany Sr., of New Britain, PA., formerly of Maplewood, NJ, passed away peacefully at home on Monday, May 14, 2018, surrounded by his loving wife Dolores of 66 years and his devoted family. Gene is survived by his four children; daughters Colleen Veni and her husband, Harry, Maureen Jansen and her husband, Lou, sons Timothy and Daniel; and daughter-in-law Kristin, widow of son Captain Eugene Edward McNany Jr.; six grandchildren, five great-grandchildren, as well as many cousins, nieces, and nephews. 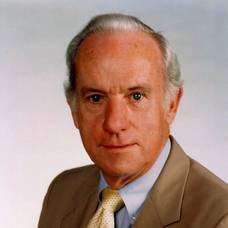 Born June 26, 1928 he was the son of the late Owen V. and Katherine McNany and was predeceased by his sisters Joan Kuypers and Katherine Corcoran, and his brother O. Vincent McNany. Gene spent his business career of over fifty years with the former Bell Telephone (AT&T) system. He was a graduate of Seton Hall University with a BA degree in Business, and Center for Corporate Communications of Boston College, Boston, Mass. A five year Air Force Veteran and veteran of the Korean War, he believed in Community service and served on many commissions and boards including; Chairman of the NJ Lottery Commission, President of the Board of Trustees-Essex County Youth House, NJ, President of the Gifford Chapter-Telephone Pioneers of America (AT&T), Member of the Essex County Vocational School Board, Member of the BSA Troop 2 Committee-Maplewood, NJ, Founder and organizer of the Maplewood Community Pool, Maplewood, NJ to name a few of the many public services Gene served on. Relatives and friends are invited to greet his family on Friday, May 18, 2018 from 10:00 AM until his Funeral Mass 11:00 AM at Our Lady of Guadalupe Church, 5194 Cold Spring Creamery Rd., Doylestown, PA 18902. His interment will follow in St. John Neumann Cemetery, 3797 County Line Rd., Chalfont, PA 18914. Honoring his wishes Gene requested that any memorial contributions in his memory be made to the Amyotrophic lateral sclerosis (ALS) Research-Golden West Chapter, PO Box 565, Agoura Hills, CA 91301, in remembrance of his son Eugene Jr. who passed away from ALS in 2012, would be appreciated. You will never be forgotten and you always be missed.